If you have anything made from unvarnished wood in your home, then mineral oil is your new best friend. Use it regularly to treat your wooden surfaces, and it not only brings out the rich color and grain of the wood, but also helps to condition and preserve it for a lifetime of use. Mineral oil is food safe, and when used on cutting boards or serving platters, it also helps to block food particles from entering the wood's pores. 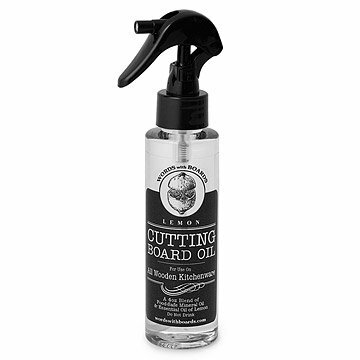 The spray top makes it easy to oil ornate or personalized boards, and the lemon essential oil adds just the right amount of refreshing fragrance. Assembled in Baltimore, MD. I didn't realize how badly my bamboo board needed this until I used it. I use it on my bamboo cutting board and wooden utensils. Worked beautifully to restore luster to my butcher block table, thanks for the quality product! This mineral oil is used for conditioning and preserving your wooden cutting board or butcher block.